An ON TIME OR FREE Limousine Service. Celebrity Limousine does more Wedding's than any other Limousine Service in the North East. We have been voted BEST LIMOUSINE SERVICE over 25 times. We have been doing Weddings for over 10 years now and we have the EXPERIENCE needed to make a ONE DAY special event like your Wedding Day, go by flawless and "without error." Celebrity Limousine does many Weddings including many private Weddings for Celebrities across New England. We are front runners in the Transportation Industry and we follow nobody. We lead. We innovate and we create the newest, latest, and greatest ideas in our field. 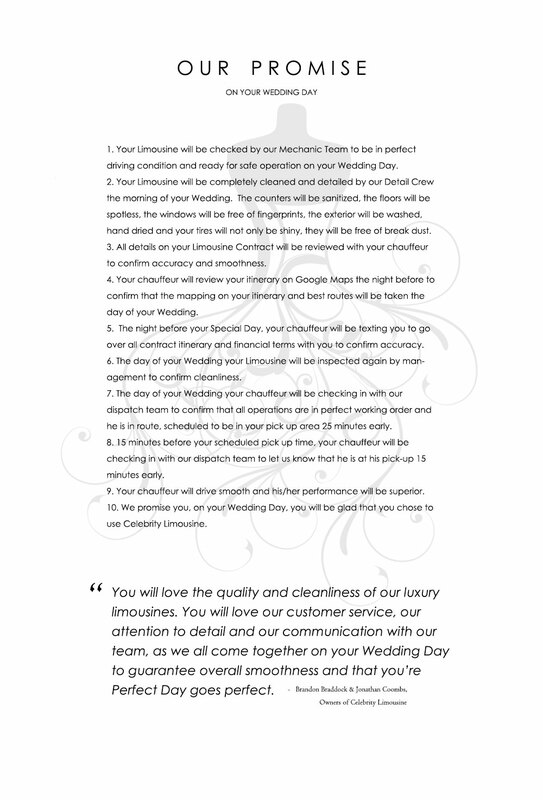 Although we do not play an important role as you do on your Wedding Day, we take your Wedding Day "very serious." That is why if we are even 1 minute late, we will give you a gift certificate in the full amount. FREE. That is our ON TIME OR FREE Guarantee to you. 85% of Limousines are late to their pick ups. And thats a fact. It is the #1 problem in the industry. Being a half hour late on your Wedding Day can have a dramatic effect and their is no excuse for it. We not only recognize problems. We solve them. That is why we own CELEBRITY CHAUFFEUR, the only chuaffeur school in America. It is so important to use a Limousine Service that specializs in WEDDINGS. The services needed on your Wedding Day and the attention to detail on your Wedding Day, are not the same when your just transfering someone to the Airport. You need a Wedding Chauffeur on your Wedding Day. Trained in hospitality, groomed for the camera and knows how to deal one on one with a bride. Your chauffeur will be all over you wedding photo album and videography for the rest of your life. It is your "chauffeur" who makes sure your limousine is clean and on time. It is your chauffeur who is supposed to make sure your wedding gown does not hit the ground. And it is your chauffeur who, after your ceremony, will be waiting for you by the limo, on the red carpet, to do a champagne toast for you in front of all your loved ones, while your video cameras are shooting live. At Celebrity Limousine, we out do our competitors in every aspect. That is why our Red Carpet Wedding Packages come with a MOET Champagne Toast, not a $2 bottle of cheap champagne. At the end of the day, you will agree with our Critics Reviews. Our chauffeurs are not only good. They are the BEST. We not only offer the BEST chauffeurs in the industry, the BEST champagne and the BEST guarantees like ON TIME or FREE, we offer the BEST Limousines in America. Because we offer OVER 175 DIFFERANT STYLES OF LIMOUSINE TO CHOOSE FROM, we get asked all the time, "Can you really get this spcific limo?". We promise you, every Limousine on our webiste can be to your personal door, here in New England, within 3 hours of your request. (Pending the limousine is not already booked with another client). One of our most exclusive features is the fact that we offer over 5 million dollars in beautiful restored antiques and over 15 million dollars in differant choices of Rolls Royce Limousines. Our Limousines win awards in Auto Shows like the BEST of the BEST. Now, that's something to brag about. The fact is we offer vehicles that cannot be found anywhere except through our network. The Celebrity Limousine Network. Through our hard work and our own constructive criticism and daily imporovements, we not only offer the very best, but we warranty every reservation with 100% SATISFACTION GUARANTEED. We promise you excellence and if you are not 100% Satisfied, we will make it right. And, just to earn your business, if you find any other Limousine Service with the least bit, comparable quality, we will not only match, we will beat any legit competitors price. Our clients are treated with the very BEST in customer service and always have PRICE PROTECTION. Copyright C 2005 - 2012 CelebrityLimousineWorldwide.com. All Rights Reserved. Celebrity Limousiine Worldwide, Inc. is a BRANDON BRADDOCK & JON COOMBS Company.